Gemologist John Heusler DBA Slabs To Cabs - Kaily Agate Gemstone!! 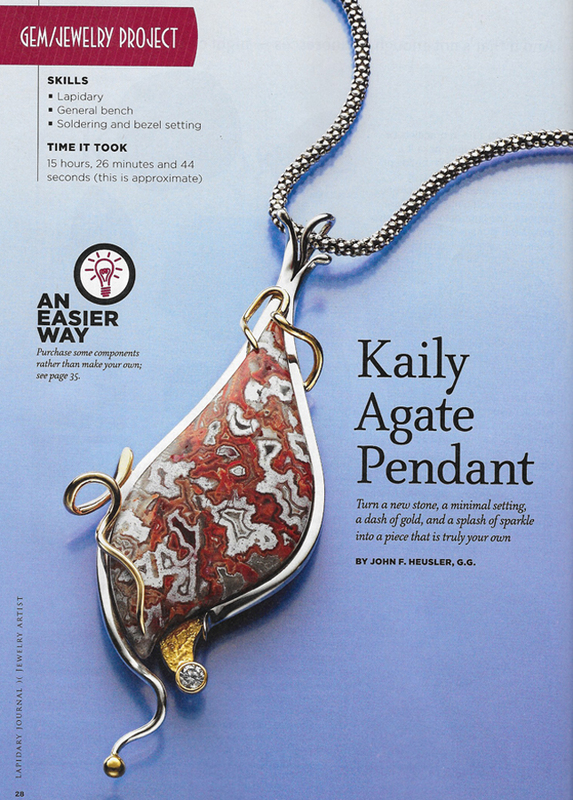 This is from the article on Kaily Agate in the Lapidary Journal Jewelry Artist Magazine's September/October issue 2014. This is another article I wrote about how I built this piece of jewelry from start to finish. This new gemstone I named after my youngest daughter Kaily. It is the sister stone to Jessite (named after my oldest daughter). Found in the same mine and same vein. Please note I will be in the Denver Show at the Coliseum Gem and Mineral Show and in Quartzsite, Tucson with Kaily Agate rough, slabs and cabochons. Perhaps even some of my finished jewelry. Copy and Paste into your browser. Single issue purchase either in hard copy or digital is available! Kaily Agate cut by John F. Heusler G. G.
Newely discovered gemstone Kaily Agate. 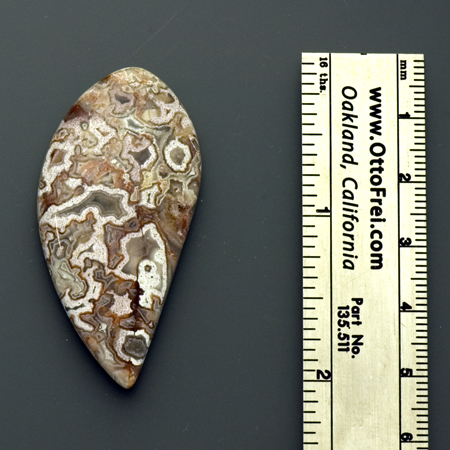 Found January 2014 and named by John F. Heusler G. G.
With the discovery of Jessite the amazing agate from Mexico (now everything but plentiful) I have discovered this new gem. It is in the same mine and same vein as Jessite just inches away. It is so different that it is quite fitting to name it after Jessica's sister, Kaily. She is my youngest daughter. I do have quite a bit of material that has the very same pattern but with less color. The cabs I have cut and shown to potential customers are VERY well received! It is a basic light pattern with a darker outline. I am getting some outlining with reds, oranges, blue, pink and even green! Amazing stuff. Seems the orange range is the rarest so far. In this same vein is a fantastic red and white sagenite. I am finding many other colors the more I cut. This seam has agate on top and bottom which should cut very nicely as well. I am calling everything else from this vein Kaily and Jessite is only what is shown in Lapidary Journal Jewelry Artist magazine. Enjoy!